Dear Aflac, a note about your advertising. I stumbled upon this advertisement on Thursday in a business magazine, and it caused me to become confused. 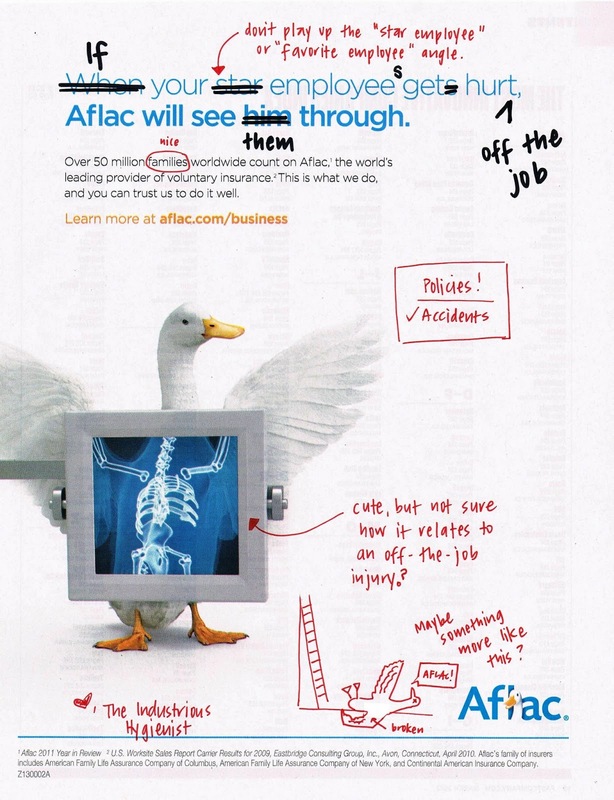 My first thought was �Aflac doesn�t do worker�s compensation!� and my second thought was �I need to fix this advertisement.� I immediately went to your Aflac.com/business website as the advertisement instructed me to. 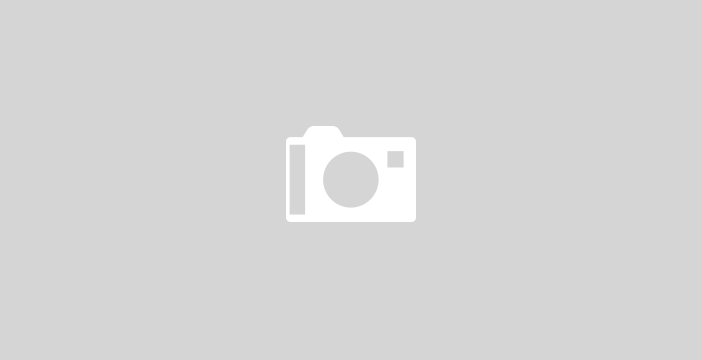 There I learned that no, you don�t provide worker�s compensation, but yes, you do provide voluntary insurance to cover accidental injury that happens off-the-job. 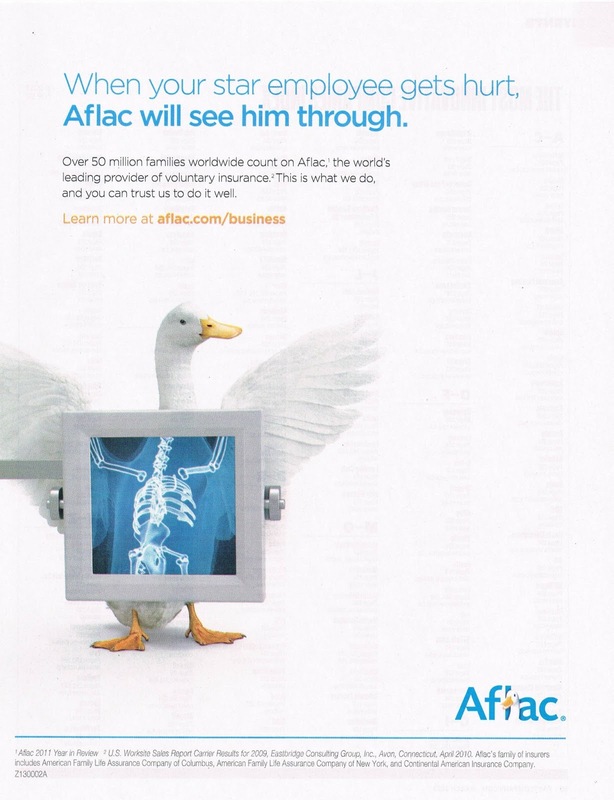 Reads: "When your star employee gets hurt, Aflac will see him through." Okay, also, why do you assume that the "star employee" is a male? Grrrr. Hear my inner feminist roar. Then I decided to learn more about your services (out of curiosity) and discovered your �AFLAC WorkForces Report � Executive Summary� from March 2012. I liked what you had to say about the state of the U.S. workforce and am paraphrasing or quoting pieces below. Businesses need to recognize �the reality of a large number of workers simply biding their time before jumping ship at the first signs of economic stability.� You state that �business leaders need to be in prevention mode.� With this focus on prevention, why, oh why, did you use the phrase �When your star employee gets hurt� in your advertisement (emphasis added)? If you could modify this statement to include education about off-the-job safety, it would make me happy. I appreciate that you didn�t blame the Internet or the various social networks for the worker distraction issues. Since many workers spend the majority of their waking hours a) away from their families, and b) at work trying to be productive, when family issues occur, workers are not able to just �turn off� their family responsibilities the second they walk in the door. The various social networks allow workers to maintain contact and *hopefully* healthy relationships with their friends and families, on their terms, rather than taking unnecessary vacations, long phone calls, long lunches, personal days, etc. 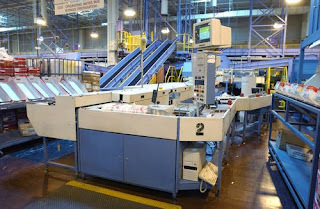 Employees feel their jobs are in constant threat due to massive layoffs during the recession. Employers have reduced benefits (at higher cost to employees), to fatten the bottom line and please shareholders; this places all the risk for rising health care costs and pathetic 401k returns on the employee rather than the employer. The Millennial generation (I am one!) has a different expectation for their careers. In short, we want to get back what we put into ANY relationship. Employers have decreased the opportunities for growth and training while asking/forcing employees to take on job responsibilities they may not be prepared for. So, in short, I am no longer confused by your advertisement and believe you offer a useful service. Voluntary benefits for employees at little to no cost for the employer � sounds good. While more business leaders are embracing cost-friendly consumer-driven models, consumers are largely unequipped and unprepared to effectively take the reins. There are long-term implications for businesses taking a short-term approach of shifting control and responsibility of health insurance decisions to workers. An organization�s degree of health care benefits engagement and knowledge factors heavily into its HR metrics � attraction, satisfaction, productivity, and retention of talent. Amid massive changes in health care, what remains unchanged is the unequivocal role benefits satisfaction plays in the welfare of the workforce. The growing importance of voluntary products in a consumer-driven health care environment characterized by a largely financially fragile population." I think your findings were well-portrayed in this image from the 2013 Executive Summary. Aflac's portrayal of the cycle: Corporate Disengagement from Benefits Initiates Cycle of Difficulties. BUT, I would like you to revise your future advertisements to focus on prevention and the services you actually offer. The advertisement shown previously is slightly misleading. The Industrious Hygienist's revision of the Aflac advertisement: "If your employees get hurt off the job, Aflac will see them through." I'm a sucker for cartoons, that's no secret, so I liked the presentation of this video from the Mental Health Commission of Canada about workplace health and safety. At the end of the video, they challenge you to "Lead the Way. Start Today." Be a champion for workplace mental health and safety - Mental Health Commission of Canada. People *usually* spend more waking hours at work than anywhere else. Positive mental health benefits everyone. Canada has a voluntary standard on "Psychological Health and Safety in the Workplace." Here's what workplaces can do to improve the overall psychological health and safety of their workers (therefore making work a more pleasant place to be), adapted from the video above and from the voluntary standard. 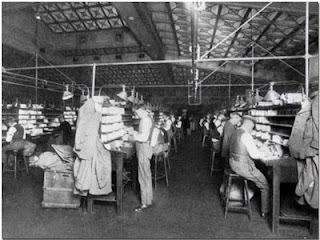 Review the standard and commit to it as an organization. Identify a CHAMPION for your workplace, who will take charge of your company's commitment (in the video, this person wears a cape as if they are a superhero). Identify gaps in your organization's existing framework - actively involve employees at all levels in this process. Develop a policy statement around workplace psychological health and safety. Communicate this statement and what it means to all employees. Commit to good mental health and contribute to the economic prosperity of your country. Canada's Mental Health First Aid program includes information about recognizing drug use, alcoholism, depression, adult trauma, and panic attacks. 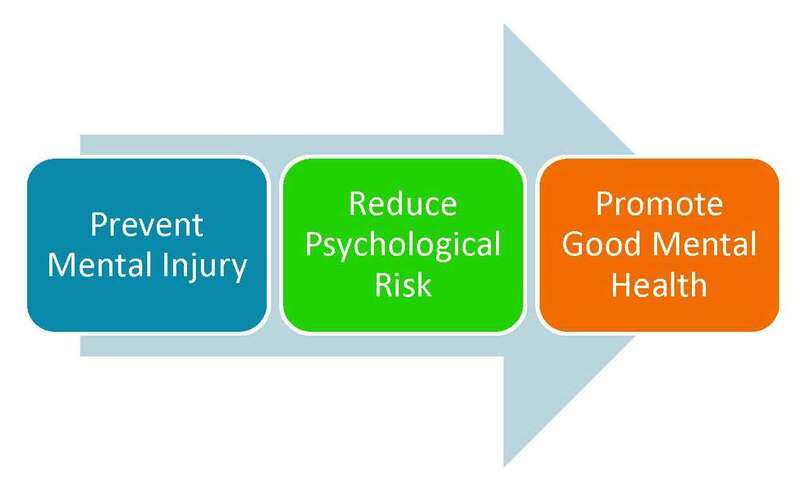 Prevent mental injury, reduce psychological risk, and promote good mental health. The Industrious Hygienist is choosing to be a champion of workplace mental health and safety. I'll be going through the voluntary standard, employer action plan, and mental health first aid handouts and explaining how these can be implemented in a workplace. The U.S. is still rolling out their Mental Health First Aid course and programs - it doesn't have the same kind of traction that the Canadian program seems to have. 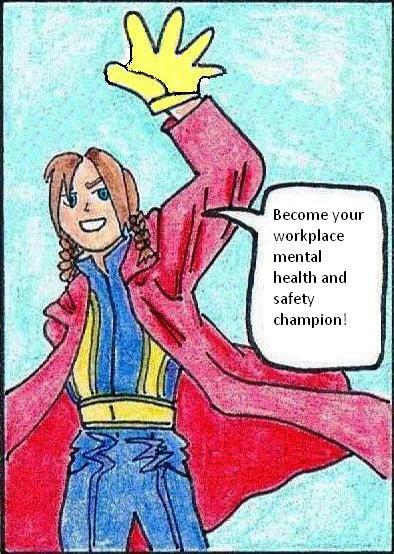 Learn more and become your workplace's mental health and safety champion today! There's so much media attention on this story, but it's close to my home, so I feel the need to post about it. Please do what you can to help. A fire started in Yarnell Hill this weekend (south of Prescott). ABC15 did a great job of distilling the facts, which I have copy/pasted below from their article with minor edits. FIRE START DATE: June 28, 2013 at 4:30 p.m. LOCATION: West of State Route 89 between Yarnell and Peeples Valley. RESOURCES: 18 engines, 18 fire crews, 8 support water tenders, 2 crash/rescue vehicles, 2 structure protection vehicles, and 4 bull-dozers. On order are more 20-person hotshot crews, type 2 hand crews and other firefighting personnel and equipment. LOSS: An estimated 200 homes and other structures have burned in Yarnell. FATALITIES: 19 - A fire crew had to deploy their fire shelters late Sunday afternoon after strong winds pushed the fire to their position and 19 firefighters died in the line of duty. EVACUATIONS: Residents in the communities of Peeples Valley and Yarnell. The same shelter used for the Doce Fire is still open at Yavapai College at 1100 E. Sheldon in Prescott, and a large animal shelter is still open at the Hidden Springs Ranch on Hwy 89, just southwest of Hayes Ranch Road. There is also a shelter open at Wickenburg High School. The Doce Fire is estimated to be up to 96% contained, but fire crews are still working there. With the heat wave this last weekend, it was up to 104 F by my house in Prescott Valley. The Prescott Firefighter's Charities is accepting donations for the families of the firefighters that were lost at Yarnell Hill. They have partnered with the United Phoenix Fire Fighters Association (UPFFA) and 100% of donations will go to the families. Donations are also being accepted at Chase Bank branches. The account number is 987218757. Questions re: these associations should be addressed to the UPFFA office at (602) 255-1500. The Daily Courier reports that the fire crews are working on the eastern flank of the fire to protect homes and structures close to the Yarnell Hill Fire. There has been an outpouring of grief and support throughout the nation, with flags lowered, mourning bands, and donations. The Yarnell Hill fire is not the only fire in Arizona - there is also a the Dean Peak Fire in Kingman that has led to evacuations in Pine Lake and Hualapai Mountain Park. American Red Cross - Grand Canyon Chapter has a reception and care center in Kingman for evacuees. They have also opened a cooling station at Kingman High School for snacks, water and coffee, so displaced residents can get out of the heat. The "Prison" fire in Tucson is still burning, is 5% contained, and has not threatened structures yet. Experts are saying that this could be one of the worst fire seasons on record. 100 Club of Arizona: Providing families of fallen firefighters with a $15,000 line-of-duty death benefit. Please donate to the 100 Club Survivors Fund in memory of the Granite Mountain Hotshots, or call 602-485-0100 to donate. United Way of Yavapai County: Opened an account at National Bank of Arizona for evacuees who have lost their homes and for the 19 families. Reference the Yarnell Fire Fund when making a donation at any National Bank of America branch. You can also donate through the United Way website, or by mail to UWYC, 634 Schemmer Drive, Suite 302, Prescott, AZ, 86305. 95% of donations will go to victims, with United Way working with the Prescott Fire Department and Yarnell to distribute donations. Prescott Fire Department: Accepting donations via mail to 1700 Iron Springs Road, Prescott 86301. Write "Granite Mountain Hotshots Family" on the check. The Hair Nail and Skin Institute (Prescott): Offering free haircuts, and hand/foot spa treatments to Yarnell Fire firefighters, law enforcement officers, other first responders, and evacuees for the remainder of the year (with documentation). Prescott College: Opening its Village residence hall to fire evacuees as a temporary shelter. For more information, call Bill or Shar at 928-713-8915. There are two events scheduled for Wednesday, July 3, 2014. The Prescott Noon Lions Club: Holding an emergency food drive from 8 a.m. to 1 p.m. Wednesday at the Albertsons on Sheldon and Marina streets, the Fry's supermarkets on Miller Valley and Willow Creek roads, the Safeway stores on White Spar and Willow Creek roads, and Costco on Highway 69. Heritage Memory Mortuary: Holding chapel services for anyone wanting to meditate and remember the heroes from 11 a.m. to 4 p.m. Wednesday. There is a Disaster Distress Helpline is a federal government service that offers 24-hour information, support, and counseling to anyone needing help with disasters such as the Arizona wildfires. I'll be providing updates as they unfold, and Mighty Spouse and I are figuring out how best to help tonight.